LAWRENCE — The Department of Mathematics has announced the speaker for its spring Distinguished Lecture Series, set for later this month. Lawrence Craig Evans, professor of mathematics at the University of California, Berkeley, and member of the National Academy of Sciences, will give present "Oscillations, Weak Convergence and Nonlinear Differential Equations," at 4 p.m. March 28 in 120 Snow Hall. 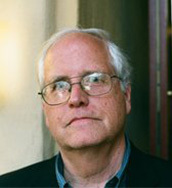 Evans received his doctorate with thesis adviser Michael Crandall at the University of California, Los Angeles, in 1975. He researches nonlinear partial differential equations, primarily elliptic equations. In 2004, he shared the Leroy P. Steele Prize for Seminal Contribution to Research with Nicolai Krylov for their proofs, found independently, that solutions of concave, fully nonlinear, uniformly elliptic equations are C2a. Evans also made significant contributions to the development of the theory of viscosity solutions of nonlinear equations, to the understanding of the Hamilton–Jacobi–Bellman equation arising in stochastic optimal control theory and to the theory of harmonic maps. He is also well-known as the author of the textbook Partial Differential Equations, which is currently the standard introduction to the theory at the graduate level. In 2012, he became a Fellow of the American Mathematical Society. In 2014, he was elected to the National Academy of Sciences. Evans also is listed as an ISI highly cited researcher.